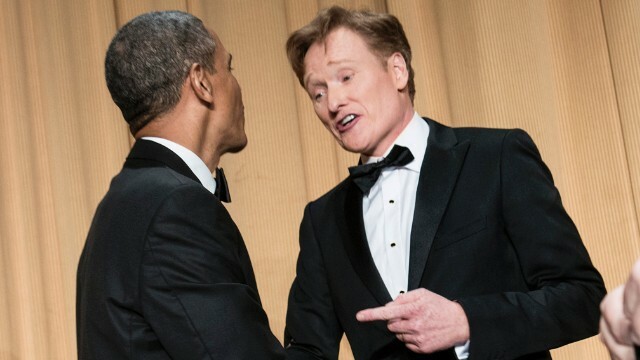 President Obama was in Century City on Wednesday night to accept a serious award from the USC Shoah Foundation â€” but his warmup act, comedian Conan Oâ€™Brien, still wasnâ€™t over what Angelenos were calling Wednesdayâ€™s #Obamajam on major routes around town. â€œThere are two things that make traffic shut down in this town â€” a visit from the president and a light drizzle,â€� Oâ€™Brien continued. â€œNow, I mean this with the greatest respect, Sir, but do you have to physically come here? We love you. This town loves you. Youâ€™ve got our vote. Youâ€™re good. â€œAudience, what do you say to â€” next time we give President Obama a Los Angeles award, we mail it to him? And then we fly down the 405,â€� the comedian said. As the president laughed, Oâ€™Brien added that â€œSkype worksâ€� and that if he insisted on continuing to come to Los Angeles, he owed everyone a ride home in his helicopter. Oâ€™Brien delivered his punch lines between speeches at the Shoah Foundation gathering, telling the crowd that the organizationâ€™s founder, Steven Spielberg, had insisted that he provide a little levity. Bruce Springsteen also performed two songs before Obama accepted the organizationâ€™s Ambassador for Humanity award.